Since 2008 the size of the “cruising boat” has seemingly doubled. It used to be that a 31ft boat was a good size for two people. Even for a small family. Now, it is unheard of that a couple would consider anything under 40 feet. “But it is also going to be our house for a few years,” they say – as if that reason alone is enough for them to purchase a boat much too large for their abilities, needs, or pocketbook. Wrong! Let’s be clear – a boat is NOT a house. It is a boat. It is the people aboard who make it a home. But it can never be a house. Nor can it be a replacement for a house. You will cook, sleep, and stow your stuff in it. But one purpose for cruising is to live in a much greater environment than a tiny boat. I would hope that you will get off that settee and explore the greater world outside the walls of your so-called house. It is a great marketing ploy – convince them that they need more, and they will pay top dollar for what they think they need. People often say they need the space for guests. They in-turn cram all their crap into the v-berth or quarter-berth, pile it high with “necessary” stuff and call it the “garage.” I’ve seen it time and time again, and have always vowed never to have a “garage.” A bunk is a bunk, and aboard Rocinante it will always be reserved as that. In fact, we have space ready for up to 5 guests (because we run a sail-training business) – each with their own locker, drawer, gear hook, and toiletry shelf. Despite having all these empty lockers, Ben and I still have room for enough personal stuff for three seasons, a sewing machine, sailing gear, a fizzy water maker, skateboard, and even a piano. We like to live minimally, but we love a few luxuries too! And we even have a private berth for Dory the ship’s cat. Convincing guests to visit is harder than finding a space for them to sleep. Try telling your non-sailing friends to book an open-ended ticket, plan for weather delays, or wait until you make landfall before scheduling their vacation time. “Weather? What do you mean weather? Can’t you just tell me when you’ll be there? I’m asking months in advance, so you should know. Plus, I need to know now so I can tell my boss, arrange for someone to water the plants and walk the dog, and get the best deal on flights.” We love visitors – but it’s hard convincing shore birds to take to the sea! When Ben and I are alone aboard our Norseman 447, we live in half the boat, but still pay full price. That’s a great deal – for a broker! Ok – so you are giving up your house, and plan to live on a boat. I hope you don’t expect an equal trade. It is anything but equal. You aren’t just trading a house for a boat. You are trading a lifestyle of security for one of unpredictability based on the whim of the weather. When it blows, you stand anchor watch, forego events and activities ashore, reschedule appointments, change priorities, piss people off. Try getting them to understand that “the weather is bad so I can’t make it,” while they take your call from the comfort of an office, a meeting room, or their house. Good luck. Nope – still a boat – not a house. Many bigger boats are marketed as a “couple’s” boat, when really it has room for twice that. It is a great marketing ploy – convince them that they need more, and they will pay top dollar for what they think they need. But you don’t need it. When you purchase a boat – you are trading one life for another. You are agreeing that there is much to be gained by living smaller. Living closer to nature. Rowing ashore to catch the last few minutes of the local farmer’s market, hanging a fishing line off the stern, reading a book and watching the sunset in the cockpit, feeling the gusts lay your boat over at night, and dashing up to the deck to make sure you aren’t dragging. Embrace that. You love it. That’s why you are choosing this life. You can do all that aboard a 31ft boat, or a 41ft boat. Any cruising boat you choose will have space to cook, sleep, pee, and eat. That is all you need. But that extra 10 feet won’t give you room for a swimming pool, an exercise room, a two-car garage, or a dining room AND a breakfast nook. Really? A breakfast nook – and you’re telling me you want a boat? I’m not suggesting that you set sail on a tiny boat with a dozen other people. Lets be clear – living with your chosen life partner aboard a boat of any size won’t feel cramped. Living aboard even a 55ft boat with the wrong crew will feel like the walls are closing in on you. Like I said – it is not a house, it will never be a house, but it is the people aboard who make it a home. Ask yourself this: What are you really after? Do you want to spend time indoors or outdoors? Do you want to see expansive sunsets or expansive settees. Even a 40ft boat will feel small if you spend too much time in it. So – get outside. For real. …you should be living big in your new ocean home who’s walls are as distant as the furthest horizon. I’ve seen too many people purchase boats that are too big for their needs. I really just want everyone to have a good, safe, experience. So don’t have illusions that buying a bigger boat will make you more comfortable living aboard. It won’t. It will only make you work harder, fix more broken stuff, and pay a lot of money for that extra space to stow the junk you don’t need. Everything costs more to maintain and fix – haul-out, new rig, dock fees, anchor size, systems, etc. Even a shackle costs so much more. Why bother with all that when, what you should really be doing is sailing, hiking, cooking good food, meeting your neighbors, meeting the locals. Most importantly, you should be living big in your new ocean home who’s walls are as distant as the furthest horizon. How can anyone feel confined when they live in that endless space every day? We’ve worked with dozens of couples – helping them go from boat less to boat owners. Dreamers to doers. Time and again, they call us a year or two later and say they should have listened to our suggestion for a smaller boat – the boat is for sale, their adventure is over. I know, I know. I can hear exactly what you are going to say to me. “Why then did you sell your Nor’sea 27 for a 44ft boat?” That’s easy – because we run a sail-training expedition business on it. If I were sailing solo, or with one or two other people, the Nor’sea would be plenty big. It is a great boat. Ideal for two people. I highly recommend it. When Ben and I are alone aboard our Norseman 447, we live in half the boat, but still pay full price. That’s a great deal – for a broker! If you are in the market for a boat – go small! You won’t regret it. Boat sizes are like weddings – people never regret going smaller and spending less, but many do regret too big and too much. In the meantime – go outside and see if you feel cramped. P.S. If anyone is in the market for a brand new boat and are looking for one under 40ft – consider the Nor’sea 37. It is the perfect boat and what we would have purchased if they were available used. It is the best combination of the Bristol Channel Cutter and the Nor’sea – which as you know, are boats Ben and I adore! 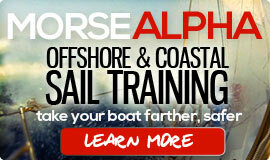 If you want a Nor’sea 37 you’ll have to get it brand new – a great opportunity. Let us know because we want to see your boat when its finished and we will consult with you along the way! We are not accepting payment from the people behind the Norsea 37 – we just really want to see this awesome boat get built! P.S.S. Not convinced? Want to sail a bigger boat to see what its like? 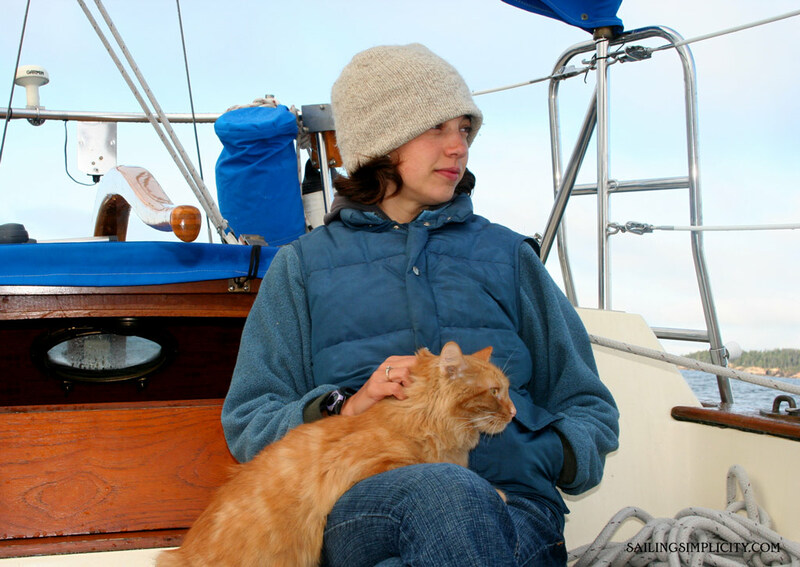 Join us on a sail-training expedition (shameless plug). We’ll even allow you to bring the kitchen sink if you want – because even with 7 people aboard, we still have space for it! Book now, our summer season is filling up fast! Yes!! GREAT POST! I wish there were more boats available under 38ft in the market! Quality over quantity! And well-thought out design is much more important than square footage. A well designed smaller boat can seem so much more useful and intuitive than a larger, crappily designed boat. Merry, ahem, I know the boats you are looking for and you are in a different market! Come to the sailing world – the better world – and I’ll show you a dozen options to live aboard under 38ft! Remember when you and I sailed Daphne! I had never even met you and never once felt cramped with you aboard – of course, that may be because you were instantly awesome! And, for once, you’ve missed the boat. LOA’s are going up for the reason that the rich are getting richer. When I started in, back in the early 70’s, w/ a little saving … not a lot of saving, just, say, 24 months of putting something away, even a young, single guy like me with a half-way decent job could buy a new 26′ or 28 footer. Used, you could buy more feet. Now a rapidly disappearing middle class is increasingly priced out of boating. At our municipal-owned marina, there was a recent attempt to sneak a huge rate-hike in, masquerading as something else, but intended solely to price out the riff-raff – like me, now a retired liveaboard boart-owner on, obviously, a fixed income: an income that doesn’t go up just because seasonal slip fees do. Another factor: there is still a glut of used boats. As time goes on, more and more (longer and longer) boat can be had for the same bucks. Of course, concomitantly, at least one generation is leaving boating as it ages – so The Glut is, I think, a secondary factor. The world is being made over in the image of the pathologically self-centered billionaire. Bigger, more expensive boats are being built now because of it. The middle class, worldwide, is dead or dying – and walking away from their boats forever. I’m writing from the perspective that they still have a choice! And of course they do! People with more money have even more choice. Rich people can buy tiny boats and be happy! When we talk to people about liveaboard, we usually hear ‘anything under 40′ you’ll be cramped’. I believe like you T – more maintenance, more of the ‘stuff’ I’m trying to get away from, more expensive to park,etc. I have my eye on a very nice early 80’s Beneteau Evasion 37. Great post! We recently went from a Dehler 34 (1992) to a Jeanneau Sun Odyssey 379 (37 feet) and we find it absolutely luxurious in terms of space for a couple living aboard for 7 months of the year (and maybe longer when we get into warmer zones). It’s easier to handle and cheaper to berth. In many of the little fishing ports we encounter here in Europe, anything over 12 meters gets complicated. Modern 37 footers are much more spacious than older model 37 footers; the Jeanneau architects have done a great job of maximizing living space while maintaining good performance and stability. On our 2-cabin version, the space for the 3rd cabin is actually “a garage” with drawers and organizers. 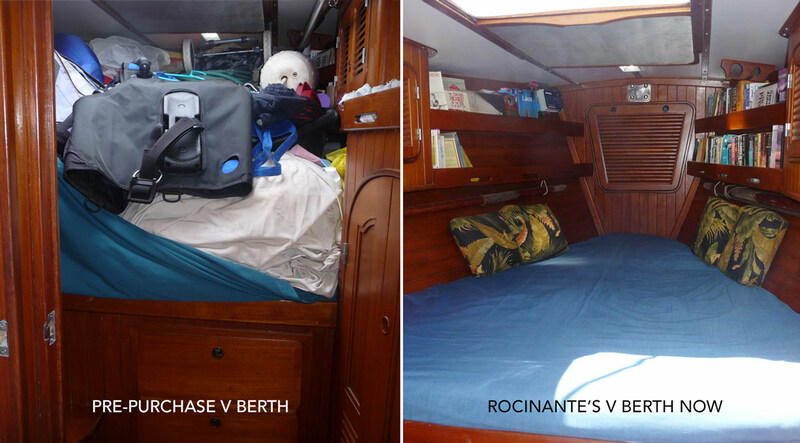 That is not to say, however, that the v-berth doesn’t get cluttered, too ! A Nor’sea 37 is an interesting boat. Just too bad not many hulls have been built. I think there is one available at the factory waiting for an owner. Wish there was more pics of it, especially the interior. I love my Nor’sea. I also like the look of the BCC. Beautiful boats. Current status of the Nor Sea 37 appears a mystery. It was originally to be built in the early 90s by Bob Eeg , owner,builder of Nor Sea Marine in Laguna Beach. I was, unluckily, and “early adopter” on this vessel after I visited the Nor Sea production facility in 1992 to view the mold and comment on the deck specifications. Original deal was that for my $5,000.00 early deposit, and that of others, we would be delivered a “complete boat” with a Perkins diesel, $114,000.00, (probably not possible, even at that time) with the first hull thought to be deliverable before 1995. Subsequently, Eeg essentially went out of business, an in some way made use of my deposit and everyone else’s and then vanished or shut down. I could not discover if any hulls were built but stayed in touch with others with deposits. There was some discussion with them about buying the mold, which appears to have been finished to produce a boat before Mr. Eeg’s disappearance (had no more contact so I don’t know what happened to that plan). I got a court judgement against Nor Sea for my $5,000.00 but was unable to enforce it due to the disappearance of Eeg and his company. To my knowledge no one else got any money back either. There may have been some chicanery to get our money because the funds were eventually sequestered in some way in an account that was overseen or reported on to the IRS. I received annual tax forms to that account,to verify my deposit in the account were held on my behalf and not the property of Nor Sea. I just wrote this all off to bad luck and paid no more attention to it until about 5 years ago when I decided to do a search on this vessel because it did seem to be an interesting boat if ever built. I learned at that time that 3 hulls had been built (not sure by whom, although it appeared that Eeg was back on this project) and photos of these hulls in very rough (condition port-lights not opened in the hull no rudder, prop etc.) seen on current un-supported web page now. However the price had gone to APROX: $175k for a “sail away” boat ( Sails, engine, etc -no finish work, a more “complete” boat with no interior joinery for some figure over $200k and a “full finished boat” for about $280k. That was several years ago and according to the sparse information on the remaining sites it does not appear that anyone bought one of these boats or actually ever put one in the water (this is yet unclear). One problem I perceived early and couldn’t find any information about, is that the transom is a nice double-ender, with apparently no gear to operate a ruder (none of the photos even show a rudder) so it would appear that although there is a post in the cockpit for a wheel, gear of any kind of system to make a working rudder is going to involve cutting through the completed hull (doesn’t seem like a good idea to me, the fewer holes in the hull the better). If anyone has any ideas how this would work – I am not a Naval Architect, nor a mechanical engineer – I’d be please to hear it. Most recent post I got in my search (12/10/16) here was that the 37 is “being built by Michael Hess (apparently the son of Lyle Hess, now deceased, who drew the original hull) of ‘Hess Marine'” with no contact info posted or that I could find on further searches for Michael Hess. So that’s my take and addition to the sad story of the “Ghost Ship” that everyone hoped would become the great Lyle Hess’ last, lasting legacy. Great points! When Jason and I were thinking about moving aboard, we would often drift larger in our boat fantasies but we saw a number of smaller boats that seemed just right. I think before we decided to be land lovers a little longer we had decided that 33-35 feet would be right for us. But I’ve also got experience on various size bars and it was obviously helpful to spend a month aboard Elizabeth with you and Ben! Great post. Agree with you 100%. We are a family of four aboard a 36 foot Westerly Conway. She was the biggest boat we felt comfortable sailing, given our experience and abilities at the time we bought her. We might have gone for something smaller, but Julian is 6’2″ and it was hard to find a boat with enough head room and stretching out in bed room for him. I didn’t want him damaging his back and getting neck problems. It wasn’t like we were going on a week or month holiday. The boat we bought would be our home. 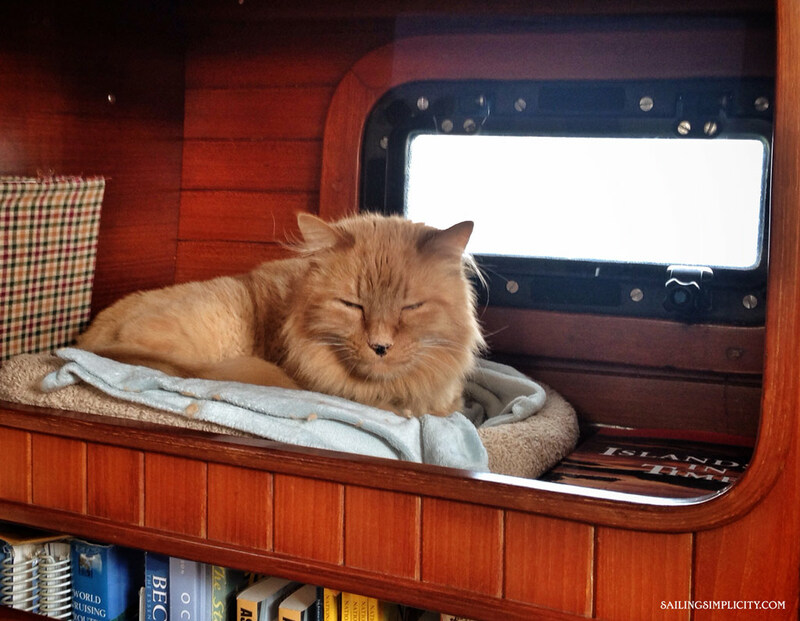 Carina has 6’2″ headroom in places and two berths long enough for him to sleep comfortably on. Despite being four people we have plenty of space, we could sleep three visitors at a squeeze and have frequently slept two. The problem isn’t our lack of space but the expectation of our visitors. Some friends who have come to visit have been amazed by Carina’s spaciousness, but my sister refuses to stay aboard because ‘there’s not enough room’. I sometimes get bigger-boat envy when I visit middle-aged couples aboard their imaculate 42 or 50 footers, but that’s probably more to do with their lack of messy children than their spacious boats. I bet if we had 50 feet the girls would make it just as messy as they do 36 feet. Carina’s not a house, but she most certainly is a home. And if she ever starts to feel a little cramped there’s a very easy solution – step out on deck or hop in the dinghy or go ashore. The world is huge!! lol, love the post, but sorry we need every square inch of our 62 sailing boat for the two of us. It IS our house and our ONLY joint home. We have made the fcsle our store room, ensuring that we can only accommodate 4 extra people at any one time…and usually two is quite enough for us. Husband is a very tall guy and he needed always to be able to walk around and shower without bending over. Whereas I appreciate what you are saying about cost and I agree entirely – sometimes bigger just is better haha! By the way – I think you two are an exception! When I was sailing my 27ft boat, people that that was on the extreme small side. I think even most couples would agree that 60ft is huge! Still not a house though. I would call that an estate! So well presented, Teresa – well done! Of course the message is nothing new, the Pardey’s were and are vocal proponents of smaller, affordable boats that can be largely owner-maintained – another aspect you touch on but lightly. Buying a boat is one thing – the costs seem to go up at double the size, but MAINTENANCE is the killer – that seems to increase as the square of the length, unless one is a very competent do-it-yourselfer. Thank you for hitting this point again, and please keep reminding us every now and then! We’re settling into our 32′ of heaven, and finding that the more we’re aboard, the happier we are she’s not bigger! This is one of your best posts. It can be applied to so many life situations. I’m 70 and spent much of my childhood in a trailer when they were 8′ wide 30′ to 45′ long. My dad “followed construction” as they said, and we moved often. There were only three of us- mom, dad and me. I look around my house now and wonder how we ever did it. How did we ever have everything we needed in a 35′ trailer? And I take another look around the house and wonder why did I collect all this junk I’m surrounded by? I’m throwing something away today. I don’t know what it is yet, but it’s going to the recycle bin. Now if I can just get myself to do this everyday for a year or two! Thanks for your always-interesting thoughts on sailing, Teresa. I agree that space on a boat isn’t like space in a house, and a bigger boat means more expenses and possible hassle. I’ve lived aboard and traveled for 10 years, first on a 28-foot engineless wooden cutter (for 3 years), which was our baby daughter’s first home, and where we lived until she was nearly three, at which point I was about to lose my freaking mind. I couldn’t function anymore. OK, maybe that was just me. But if we hadn’t gotten something bigger (we borrowed some friends’ 45-foot wooden Bahama ketch) I would no longer have been able to think and function as a parent, or be able to earn a living (writing-related work). Now we have a 38-foot Hans Christian (still with a cat), an awesome boat in my opinion, which we got very cheap and have fixed up. But no matter how much crap I get rid of, it’s still really hard to keep order to the point that I can think and work. (I actually think the cat is a great role model. She loves everything about the boat, even bad weather, major swells just cause her toy to roll around so she can chase it more enjoyably.) So, after devoting a lot of thought to this question, I feel like there may be a point at which working hard at the day to day of living aboard in minimized circumstances can start to take away from the (only my?) ability to think and create. On the subject of visitors, a cruising friend of ours would tell people that wanted to come sailing, “You can pick a date or a place, but not both”. Just make sure she’s big enough to have a permanently installed galley eh!? As far as full time liveaboards(specifically monohulls) are concerned I would have figured under 30′ for a single person,.. low to mid 30’s for a couple, and low 40’s for an average sized family. One of the major attractions to me personally of the liveaboard lifestyle is the potential for very low living costs, which is only really feasible if you stay small, and live on the hook. Thank you! I was beginning to feel like a crazy person for buying a Pacific Seacraft 34 when every one keeps telling me a couple (and their dog) can’t possibly cruise on anything less than a 45 foot boat. In truth, people I meet in 45 foot boats are just as miserable with the lack of space as I sometimes am. Which leads me to think that it’s more about the attitude than the space. BTW, I hope you’ll write more about avoiding the “garage” syndrome. Our quarter berth has an extra sail and all of our spare parts and most of our tools. I’d love to clear it out. But since the only thing in there we haven’t used is the spare sail, I’m at a loss as to how to change it. How much of it is paring down, good organization, and specially designed storage? And were you able to keep all your berth space for berths when you were on a smaller boat? What a great article. Can’t agree more. Our family has a 23Ft trailer sailor, last season we spent over 50 days/overnights on the boat and up to 11 nights at a time. The cockpit is an extension to the living space when at anchor, even in poor weather. We predominantly cook outside to reduce odors and moisture in the cabin. Loki goes in the water at the end of April and is hauled out at the end of October. During the boating season she is on her mooring and in my backyard in the winter where we sit in the cockpit and eat snacks dreaming of future adventure and do the required maintenance. The sheer simplicity of our boat is a joy, the size and simplicity of it means there is more time to use the boat (there is always maintenance, don’t kid yourselves ). So many people that have boats rarely use them. There is always a however, …..we have pushed the limits of our vessel and ourselves and we are looking for a boat no larger than 32 feet, shallow draft, with an enclosed head that will take us into retirement and beyond, with the intention of spending up to 3-4 months at a time cruising in the Pacific Northwest . Thanks Teresa for the thought provoking articles. I think one thing you missed is that a bigger boat is a FASTER boat. Waterline length and performance could make the difference of outrunning a storm or being caught by it. It could meaning making landfall in the daylight rather than entering a strange harbor after dark. Being 70 miles further away at the end of a day can make that difference. I’m presently in the market for a seaworthy blue water boat. First thing I do after finding a model I am not familiar with is to look up its projected performance-usually I use the PHRF listing provided by US Sailing. Performance wise your Norseman 447 is such a boat-the Nor’sea or Bristol Channel Cutter are not. A boat should be sized according to the anticipated number of crew. Properly set up two people can sail a 44′ boat-it just needs to be properly rigged. Think safety, comfort and speed-in that order. I think with proper planning you don’t have to make landfall at night and can avoid major storms in smaller boats. I did just fine on my Nor’sea 27. A big boat may be faster, but it doesn’t solve all safety challenges. It actually presents additional ones. Speed isn’t the only solution to safety. So, with that in mind – with a broad perspective – considering all things that contribute to safety (skill, maintenance, cost, equipment, preparedness, etc), I would still recommend a boat smaller than 40ft for a cruising couple. I’ve cruised on boats from 27ft to 125ft, thousands of miles at sea! Thats what my experience tells me. I grew up cruising with my parents on Narragansett Bay and Vineyard Sound. When my dad became to old to sail on his own (he’s in his 80s) i came to the same conclusions you did. I purchase a thrice pre-owned Shannon 28 and love it. I have found this interesting so I am going to ask some advice. 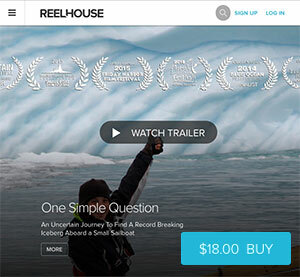 What if you are looking for a boat the will accommodate 12 people living aboard full time? We think we might get away with a 55 to 60′ but I am curious on your own recommendations. Thats a lot of people! Why so many? Thanks Teresa, we are planning to move aboard and we have 10 kids, so with myself and my husband there are 12 of us. Just wondering on your thoughts on size. Amen!! I just bought a Westsail 32 which will be my last boat; all I’ll ever need for years of wandering. I both agree and disagree. True, you should not buy more boat than you are able to handle until you are well experienced. Too many new to sailing people jump in to boats much larger than they need but more importantly are simply not experienced enough to handle. Our first “real” boat we owned for 6 years (and just sold last year) was a 2002 Benneteau 331. We thought it was SO big initially. We learned a lot owning her and we both loved her but she was quite tender and I had decided not to make certain upgrades to extend her legs knowing it would not be our forever boat. We made a big jump to a very well-prepared (by its previous owner) 2004 Beneteau 50 and we could not be happier ! Yes it’s a lot more boat and yes everything costs more… but she’s much faster, sails like a dream, is extremely comfortable and has the long legs I wanted for the type of passages we have planned. Essentially she is well able to take us pretty much anywhere we wish to go and we do not regret making such a large jump at all. So I suppose what I’m saying is, owning smaller for it’s own sake is not necessarily better… it has its substantial limitations. Get experience 1st… then buy as much boat as you “need”. To really put things in perspective, watch this documentary. Nine kids and a man & wife in a 24′ motor home! But the kids surfed every day and never had their spirits broken by becoming educated consumers. Great post, and so glad to read that you suggest cruising on 40 ft or less! Our Catalina is 30 feet and with just myself and my husband, Ken, I think we’ll be pretty comfortable on her. She has a roomy interior and cockpit, and will be less to maintain and pay for during the rare stay at a marina. We’re mainly concerned about storage (tools & spares, not bringing a bunch of clothes) and weight distribution. Can’t wait to get our there later this year and find out! I couldn’t agree more with your philosophy on boat size. Thirty years ago my partner and I built a 26′ Wharram catamaran. It was all we could afford and were determined to go cruising on a small budget. We had a tent to cover the open deck and essentially lived aboard for several summers in Cornwall, UK. Perhaps it was taking cosiness to an extreme but it allowed for a simple, inexpensive existence. I have since graduated to larger monohulls on the west coast of British Columbia – the latest a 30′ C&C. It’s all about values, lifestyles & adaptability. Like you, I have promoted the small cruising boat. During the late 80s/early 90s I wrote many articles for UK sailing magazines such as “Practical Boat Owner.” My ebook “Suilven’s Travels: A Life Changing Celtic Odyssey” is available on Amazon and other outlets. It tells the tail of quitting a stable career and pursuing happiness on the ocean. Building a boat and then sailing it around Britain was quite an adventure! 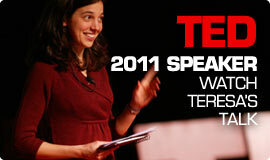 I loved your TED talk and have been keeping an eye on your progress. I upsized from a 30 foot cutter to a Flicka 20. The extra room is amazing. As my mid-life crisis hit, I got bit bad by the bug of retiring early, buying a bluewater cruiser sailboat, and living cheaply and simply while exploring the world and meeting new people in the years that I have left. I knew that I would be fine with even a small boat like Daphne, I’ve backpacked for decades and been OK with giving up luxuries for the greater pleasures that come from experiences you can’t get without making those sacrifices…but the wife couldn’t initially think of living on something as “small” (as she put it) as even a 50’er. I think you are right, that the “more you have, the more you want”, and our current comfortable house is a bit difficult to give up for her I think. Thank God she started coming to her senses, realized that not only would the costs be higher with such a large boat, but also it would be more difficult to single-hand in case one of us become incapacitated, and that at the end of the day the things we were thinking of as “necessities” truly were not. Last fall we purchased a post-blister-years 1981 Valiant 40, a compromise I think that works for us both. We hope to both remain gainfully employed for the next three years or so, use that time to build our sailing skills and use our current income to do the necessary refits and such and to save more $$ to more easily live off the interest (and the wife’s pension) while cruising in our early retirement. One question I am trying to figure out, which you touch on in a different article, is how to deal with things like continuing to keep our boat documented, our MMSI’s current, pay our taxes, all without having a “permanent address” and living overseas ON the sea for years at a time. Anyways, maybe we’ll see each other in some far-flung anchorage someday. Fair winds and keep living the dream! Didnt you move into a 45 footer? Who decides if the person or couple is buying a boat to large for themselves, abilities or pocketbook than the buyer? People are responsible for there own purchases arn’t they? Or do you think we need a European style system of Certs in order to buy and sail a boat? Retirees today have more money and I think this more than any other factor is driving up “average” sizes.House square footage of new construction has also doubled in the same period. Does a retired couple “need” a 3000 sq foot house? Of course not but people buy what they want not what they need. No, a retired couple probably doesn’t need a 45′ boat anymore than they need a 3,000 square foot house (or both). I certainly believe in free choice but I find it sad that our environment is not a consideration. The bigger you buy just because you can ultimately consumes resources that our planet cannot sustain. This also creates scarcity which drives costs up for everyone else. Her blog’s entire focus is, as she put in her bio, is to “share meaningful thoughts on simple living”. A multimillionaire retiree couple indeed my be more focused on comfort than simplicity, on wants more than needs, and then some large expensive ULDB with all the bells-and-whistles is indeed both within their means and better suits their lifestyle aims. But for the rest of us plebs with much more modest means, we may have to make some sacrifices to be able to afford an early retirement to a cruising lifestyle. That is where here blog finds relevance, and provides interesting insights on that living a “sailing simplicity” lifestyle. I am sure that wealthy retiree couple would find a “sailing luxury” blog more relevant to their situation. We currently cruise part time in an Island Packet 27 Auxiliary cutter. Solid little boat and she has served us well. I agree with the view that invitations to “come sailing” have a very small pickup rate. However we have had people aboard from time to time, and in 27 ft, you had best be on the best of terms! We have spent extended, and glorious times aboard in reasonable comfort with just the two of us, and often I have enjoyed sailing and living aboard alone, while working ( from the boat, via internet in exotic locations, as well as ports adjacent to my clients). But, when there is a project to do, parts/gear to be found in storage, or an engine repair or oil change, the boat becomes a shambles, organized, but chaotic. In the last case, engine related work, my wife has a choice, stay below in the v-berth, perch in the cockpit or go ashore. If the task becomes complicated, and therefore longer to accomplish (don’t they all) the inconvenience becomes more active. Our quarter berth is the garage. Getting something out of the quarter berth can render the salon an obstacle course, and if not achieved in a timely manner, creates some tension in upper management. The stowage of essential replacements eg spare starter, alternator, engine water pump, tools and assorted hardware and operational consumables, also presents problems, leading to thoughts of eliminating some of these necessities. Such a move would have made our lives much more difficult when the engine coolant pump failed in Cabo San Antonio Cuba. Though our invitations to come aboard are seldom accepted, we have thoroughly enjoyed having those who have been interested come aboard. But it is more like camping out than than comfortably cruising. Under way, three people can manage quite nicely, four is more demanding and only appropriate for day sailing or very short periods of time. But I believe boats, while having their own aesthetic and emotional attraction to the individual sailor(s), are tools or appliances that help us fullfil a want or need. Difficult to substantiate a cruising life with work that contributes to the betterment of humankind. Like any tool, it is best to have the right one for the job. When I am advising people regarding the purchase of computers and or networks, I always ask, “what do you want it to do?”. Though I own a number of laptop computers, this is being written on an inexpensive tablet. Our requirements dictate that we have a boat that is safe and readily handled by a solo sailor under certain circumstances, but generally by a couple. It should have enough room for privacy, sleeping, dressing and performing ablutions, have a compact but functional galley and a dining area to facilitate entertaining, and enough accessible storage that good, tools, supplies and personal gear can be accommodated and utilized without limiting the use of living space. Since we are of retirement age, and, since we live in northern Canada, but cruise in warmer climes eg the Caribbean/ Central America etc, we want a pilothouse, with dual steering inside and in the cockpit. We would prefer a cutter ketch/ yawl, for ease of sail handling and greater choice of sale plans in heavy weather ( and it is a beautiful site to see under full sail!). 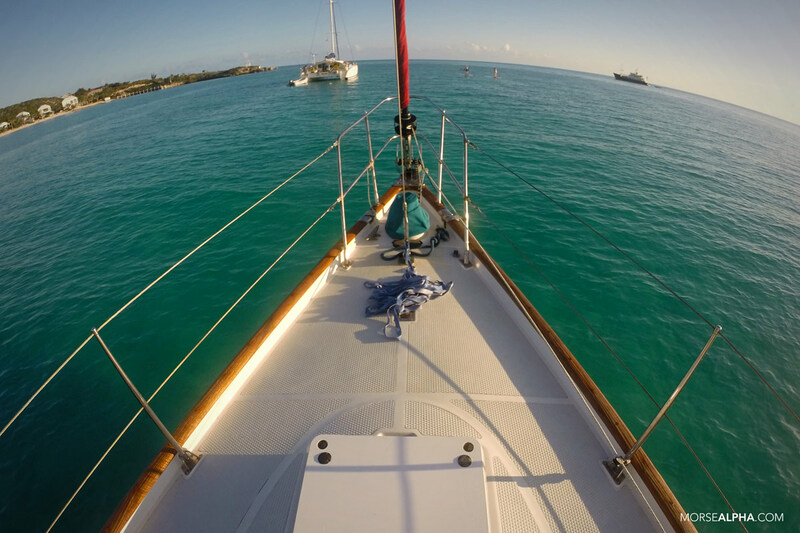 We have always sailed full keel boats, for their tracking ability and ease of motion. Just as we decided, when we sold our Albert 22,that the key criteria for a new boat was a separate, enclosed head, we are want a boat that has enough space at the stern to accommodate davits, BBQ, man overboard gear and a stern anchor without looking like a junk yard and creating a hazard for docking etc. But even between my wife and I there is a difference of opinion on size of boat. But we agree, that selection and acquisition of a boat is always a compromise. When we have moored and stored our boat, we have always been thankful for the less expensive overall length. We agreed, when we bought Starsinger, that we were willing to pay more for a smaller, but excellent quality boat. In keeping with that sentiment, we are looking at older, high quality pilothouse cutters that we can afford, including the inevitable repairs and upgrades. Your post had me waffling for a bit. Then I discovered that your definition of reasonable length was less than 40 ft. Hurray! The vessels we are considering are 37ft, but that additional ten feet will make a world of difference in our opportunities for passages, ability to host friends and family, and the preservation of a tranquil but functional shipboard environment for each and both of us. This post has been very helpful in focusing our thoughts about this next sweet sailing home. Alongside, Isla Mujeres, Work, Mexico. I believe the younger you are, the less you tend to need. However, the older you get the more space and comfort you need. Well, that’s me anyway. Great article, thank you! The first sailboat I ever bought was a 1979 San Juan 24 and I lived on it for 2 1/2 years. You couldn’t even stand up in it. Then I moved up to a 28ft Grampian and then onto a 29ft Columbia. Then I got a rare sailboat which was a 1966 Alberg/Ericson 35ft. I loved the sailboat but it was so hard to keep up with everything on it. I have been landlocked for 8 years now in North Dakota and decided I wanted to go back to living on the Ocean. I just bought a 1969 24ft Bristol for me and Puppy to live on. I believe it will be plenty big enough for me and her. I will add a hot water shower in the cockpit and the sailboat is good to go. It has an outboard engine in the well. 2012 Mercury, and 5 sails all in really good condition. I got the sailboat for a very reasonable price and with its 3.5ft Full Keel will make a great little cruising boat.